List all functions called by the selected function. The resulting list lets you examine specific call chains to find which ones have the greatest performance impact. You can expand the entries of descendant functions to see how execution time is distributed among them. In the called functions list, the columns that are shown by default or that can be selected through the Preferences dialog are the same as those for the original profiling results. Also, you can right-click again and choose this same option or Show Reverse Calls (if it's available) to navigate up or down a particular call stack.
) toolbar buttons to go between the menu action results and original profiling results. List all callers of the selected function. The resulting list shows the execution times for all calling functions. The same columns are shown, and you can right-click again and choose this same option or Show Calls to navigate up or down a particular call stack. You can show the reverse calls only for functions compiled with profiling instrumentation. 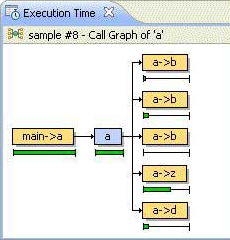 Display a graph of how the functions are called within the program. This graph represents functions with colored boxes. The selected function appears in the middle, in blue. On the left, in orange, are all functions that called this function. On the right, in lighter orange, are all functions that the selected function called. To see the calls to and from a function, click its box. If you hover the pointer over this box, Deep Time, Percent, and Count information is displayed, if it's available. You can show the call graphs only for functions compiled with profiling instrumentation.